Under international law an armistice is a legal agreement (often in a document) which ends fighting between the "belligerent parties" of a war or conflict. 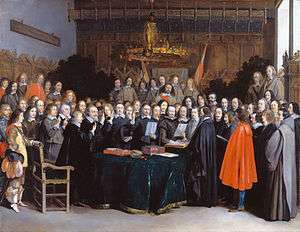 The Hague II (1899) Treaty, says "If [the armistice's] duration is not fixed," the parties can resume fighting (Article 36) as they choose, but with proper notifications. This is in comparison to a "fixed duration" armistice, where the parties can renew fighting only at the end of the particular fixed duration. When the belligerent parties say (in effect), "this armistice completely ends the fighting" without any end date for the armistice, then duration of the armistice is fixed in the sense that no resumption of the fighting is allowed at any time. For example, the Korean Armistice Agreement calls for a "ceasefire and armistice" and has the "objective of establishing an armistice which will ensure a complete cessation of hostilities and of all acts of armed force in Korea until a final peaceful settlement is achieved. ↑ "The Armistice". The War to End All Wars. FirstWorldWar.com. 1 May 2004. Archived from the original on 5 January 2007. Retrieved 2007-01-04. ↑ "1949 Armistice". Middle East, Land of Conflict. CNN. Archived from the original on 2007-05-03. Retrieved 2007-01-04.